Colin Trevorrow has said, recently, that he’s not going to direct a Star Wars movie, that after working on Jurassic World, part of an extant franchise as well as a huge step up in production scale than his only other feature, SafetyNot Guaranteed, he wants to do something personal and original. But as we’ve learned time and time again, never say never, and according to one report at least, he just got the job directing Star Wars: Episode IX. Heroic Hollywood dropped the scoop, and though it is unsubstantiated at this point, so make of it what you will, they claim when Lucasfilm hits Hall H later today at San Diego Comic-Con, they’ll announce Trevorrow as the director of Star Wars: Episode IX. That certainly would be big news, worthy of the venue, and with the official proclamation that Phil Lord and Chris Miller are going to direct a Han Solo standalone movie, it does seem like they’re solidifying their lineup (according to a leaked photo, it looks like they may also reveal the rest of their upcoming slate of films as well). 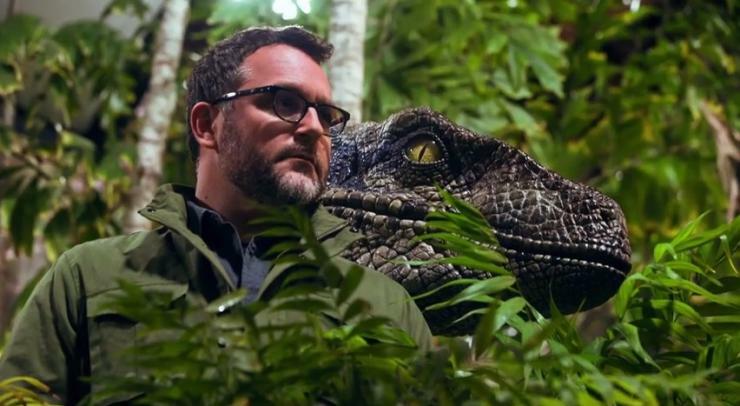 Hiring Trevorrow would also fit in with Lucasfilm’s pattern of hiring hot young talent, people who grew up as Star Wars fans, to reinvent and reinvigorate their franchise. And now that he has Jurassic World under his belt, he’s also shown he can work on this scale. As the schedule stands, J.J. Abrams’ Star Wars: The Force Awakens opens later this year, followed in 2016 by Gareth Edwards’ Star Wars: Rogue One, Rian Johnson’s Star Wars: Episode VIII in 2017, and Lord and Miller’s Han Solo film in 2018. Presumably, this means that Trevorrow’s Episode IX will hit in 2019—the model appears to be Episode films alternating with the so-called Anthology films, though we’re not exactly sure where that Obi-Wan Kenobi film that’s been rumored will fall. In theory, we’ll find this out later today at Comic-Con.